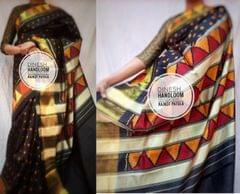 Patola is a handloom saree, usually made of silk, which can be made either as single ikat or double ikat. Patola silk is considered as one of the best hand-woven silks in India. 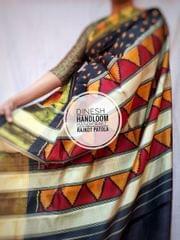 Single ikat sarees are vertically resist-dyed and the double ikat sarees are horizontally resist-dyed. Entire process of creating a patola saree varies from one month to a year. Generally, double ikat patolas take maximum time to make. Single ikat patolas take anywhere from 7 days to 21 days to make depending on the designs. Patola weaving is a lengthy process and requires high degree of precision and skills. Patola sarees have long longivety and do not loose their color and magnificence. These are often passed on as an heirloom to the next generations. Patola sarees are mostly worn on special ceremonies like baby showers as they are considered to bring good luck. 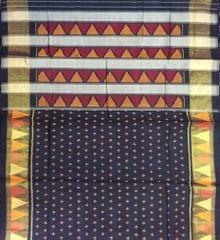 This patola saree has been handwoven by Dineshbhai Makwana of Gujarat. He is an internationally renowned Patola master weaver. His creations are famous among celebrities, NRIs as well as patrons of Patola sarees from India. This distinction guarantees the authenticity and stringent quality standards that he maintains in his Patola Sarees. This single ikat Patola Saree is handpicked from the exclusive collection of Shri Dineshbhai Makwana. This saree will bring its grandeur and elegance to your style. The saree is made up of pure silk and comes in beautiful colors. This is a full-length saree with blouse piece. Product colour may slightly vary from the image shown due to camera light conditions and your monitor settings.